‘What a delightful sight it is, after a shower of rain, to see the dear Women tripping along and tucking their drapery round their lovely hips, now & then giving one a glimpse of a lovely ankle & part of a full leg.’ This is Benjamin Haydon, an English painter born 230 years ago today. He was an artist with a significant talent, but his allegiance to 18th century trends, especially historical subjects, meant he was swimming against the Romantic tide, one which would make household names of William Blake and J. M. W. Turner. Chronic financial difficulties compounded his artistic frustrations, and he rarely managed to live within his means, especially after he had married and had children. His story is a sad one, but his characterful diary - initially published in five volumes - is superb because it not only tells us much about the man, but also gives picturesque insights into London life, whether the art and literary scene, chasing after girls or the trials of a day out with his family. 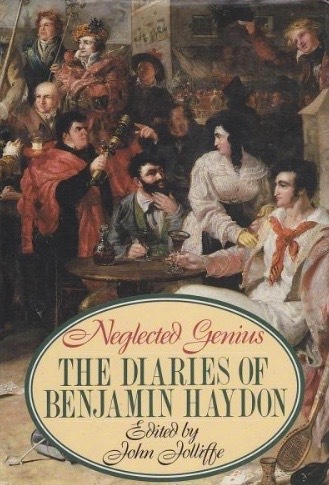 The following is a chapter on Benjamin Haydon taken from my (as yet) unpublished book London in Diaries (see The Diary Review for more about this). Though thriving in the early 19th century, the London art scene was very much in flux. Painters associated with the Romantic movement - William Blake, John Constable and J. M. W. Turner - were moving away from classicism and its focus on history favoured by, among others, Sir Joshua Reynolds, first president of the Royal Academy, and popular interest was moving with them. Benjamin Haydon, an ambitious young painter from the west country, arrived into this cauldron of change, his heart set on following in Reynolds’ footsteps, and re-establishing a grandeur of British art through historical painting. He wrote in his autobiography, ‘I thought only of LONDON - Sir Joshua - Drawing - Dissection and High Art.’ Unfortunately, Haydon’s life in London was to be beset with frustrations and difficulties, both artistic and financial, which would eventually lead him to take his own life. Today, his autobiographical writing and especially his diaries have saved him from obscurity, for they demonstrate an immense vitality of feeling and observation. They give brilliant insights into aspects of London, from its literary world - he was friends with the Romantic poets - to the trials of a day out to Gravesend with his family. Haydon was born in Plymouth [on 26 January] in 1786. His father worked as a bookseller/publisher, and his mother was the daughter of a priest. He was schooled locally, but the relationship with his father, who had very different ideas for his career, was always strained. In 1804, he escaped to London. Initially thinking he would study alone, he soon became drawn into the Royal Academy, in particular through its recently-appointed keeper, Henry Fuseli. Aged 21, Haydon exhibited for the first time. The painting - Joseph and Mary Resting on the Road to Egypt - sold for £105. Two years later, he finished The Assassination of L. S. Dentatus, which sold for twice as much. Although it increased his fame, it also resulted in a lifelong quarrel with the Academy, which, he felt, had failed to hang it with sufficient prominence. An allowance from his father ceased in 1810, leading Haydon to start borrowing money, a habit that dogged him for the rest of his life. During the 1810s, he travelled to Paris and studied for a short while at the Louvre. Works such as Christ’s Entry into Jerusalem and The Raising of Lazarus followed, but so did his first arrest for debt. In 1821, Haydon married Mary Hyman, a young widow with whom he had fallen in love some years earlier. Mary already had two children, and she bore eight more, although only three of these, including Haydon’s first born Frank, survived beyond childhood. In debt again, he was sent to prison for the first time in 1823 - other incarcerations followed at regular intervals. One of his most well-known paintings, from this time, The Mock Election, shows those in jail imitating an election taking place outside. King George IV gave him £500 for the work. When not in prison or working on commissions, Haydon began to tour the country lecturing on painting and promoting his idea that important buildings should be decorated with historical representations of glory. In the late 1830s, he published a substantial essay - Painting and the Fine Arts - and soon after began writing his autobiography. This was edited by Tom Taylor in three volumes and published posthumously, in 1853. Today, it is considered one of Haydon’s most important achievements. Haydon began keeping a diary in 1808, and continued the practice throughout his life, the very last entry being on the day of his suicide. This diary was first quoted extensively in the three volume autobiography edited by Taylor, but publication of the complete text had to wait until the 1960s when Harvard University Press published five volumes, carefully edited and annotated by Willard Bissel Pope. In 1960, the Keats-Shelley Journal reviewing the diary called Haydon the only English romantic, not excepting Byron, to parallel ‘the self-torturing sophist, wild Rousseau’; and said of him that ‘a great writer was lost’ because again and again his sketches were more vivid than his novelistic contemporaries. I began to study in London in lodgings in the Strand, 342, May 20th, 1804, and studied night [and] day, till I brought a weakness in my eyes, which obstructed me for 6 weeks. In January, 1805, I first entered the Academy. March, went into Devonshire, where I obtained bones from a Surgeon of Plymouth and drew nothing else for three months; returned to the Academy in July; met [David] Wilkie [Scottish painter] there first time. Studied incessantly, sitting up many nights, shattered myself so much obliged to leave off. Went into Devonshire for the recovery of health. Began to paint after two years’ application to Anatomy & Drawing, May, 1806. Commenced my first picture, October 1st, and finished it March 31st, 1807. Went into Devonshire for 6 months. Studied heads from Nature. Came to town. My dear Mother died at Salt Hill. January 1st, 1808, commenced by second Picture, Dentatus. In passing Piccadilly I observed in some horses galloping the various positions of their limbs - what was the position of the fore legs when the hind legs were in such a position, &c - it is astonishing how truly you get at their motions by thus scrutinizing; I made some sketches, after I arrived home, and they seemed to spring and had all the variety I could possibly wish - and such a look of Nature and activity! I walked to see Wilkie yesterday to Hampstead; as I returned about four o’clock the Sun was on the decline - and all the valley as I looked from Primrose Hill wore the appearance of happiness & Peace. Ladies glittering in white, with their aerial drapery floating to the gentle breeze, children playing in the middle of the fields, and all the meadows were dotted with cows, grazing with their long shadows streamed across the grass engoldened by the setting Sun. Here was a mower intent on his pursuit, with his white shirt and brown arms illumined in brilliancy; there another, resting one hand on his Scythe, and with the other wetting it with tinkling music - some people were lying, others standing - all animate & inanimate nature seemed to enjoy and contribute to this delicious scene, while behind stood the capital of the World, with its hundred spires - and St Paul’s in the midst towering in the silent air with splendid magnificence. Went to the House of Lords to hear the Prince open Parliament in State. It was a very grand affair - the beautiful women - educated, refined, graceful, with their bending plumes & sparkling eyes - the Nobility, the Chancellor - I could not help reflecting how long it was before society arrived at such a pitch of peace & quietness, that order & regulation such as I witnessed existed. What tumult, what blood, what contention, what suffering, what error, before experience has ascertained what was to be selected, or what rejected. I felt this morning an almost irresistible inclination to go down to Greenwich and have delicious tumble with the Girls over the hills. I fancied a fine, beamy, primy, fresh, green spring day (as it was), a fine creature in a sweet, fluttering, clean drapery, with health rosing her shining cheeks, & love melting in her sparkling eyes, with a bending form ready to leap into your arms. After a short struggle, I seized my brush, knowing the consequences of yielding to my disposition, & that tho’ it might begin today, it would not end with it. Sir Joshua’s exhibition opened. The first impression on my mind was certainly that of flimsiness. They looked faint, notwithstanding the effect was so judiciously arranged. Sir Joshua’s modes of conveying ideas were colour & light and shadow; of form, he knew nothing. The consequence was he hinted to his eye & untrained hand, and with great labour & bungling, modeled out his feelings with a floating richness, an harmonious depth, and a gemmy brilliancy that was perhaps encreased by his perpetual repetitions, and which renders him as great a master of colour as ever lived. Of poetical conception of character as it regards Portrait, he had a singular share. How delightful are his Portraits, their artless simplicity, their unstudied grace, their chaste dignity, their retired sentiment command us, enchant us, subdue us. The exhibition does great credit to the Directors of the British Gallery. It will have a visible effect on Art; it will raise the character of the English School; it will stop that bigotted, deluded, absurd propensity for Leonardo Da Vincis & insipid Corregios, and as men who shared Sir J’s friendship and been soothed by his manners, it does credit to their hearts as men. What a delightful sight it is, after a shower of rain, to see the dear Women tripping along and tucking their drapery round their lovely hips, now & then giving one a glimpse of a lovely ankle & part of a full leg. I rode yesterday to Hampton Court round by Kingston & dined at Richmond. The day is delicious, the hedges smelling of may blossom, the trees green, the leaves full & out, the Thames shining with a silvery glitter, & a lovely girl who loves you, [in] the dining room of the Star & Garter at Richmond, sitting after dinner on your knee, with her heavenly bosom palpitating against your own, her arm round your neck playing with your hair, while you are sufficiently heated to be passionately alive to the ecstasy without having lost your senses from its excesses - Claret on the table and the delicious scene of Nature in Richmond Park beneath your open window, moaty, sunny, out of which rises the wandering voice of the cuckoo, while the sun, who throws a silent splendour over all, sinks into the lower vaults & the whole sky is beginning to assume the tinged lustre of an afternoon. 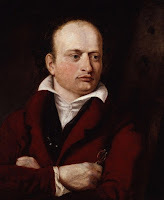 Dined at Kemble’s farewell dinner [the actor John Philip Kemble had played his last stage role, Corialanus, a few days earlier, his retirement having been hastened, perhaps, by the rise in popularity of Edmund Kean]. A more complete farce was never acted. Many, I daresay, regretted his leaving us, but the affectations of all parties disgusted me. The Drury Lane actors flattering the Covent Garden, the Covent Garden flattered in turn the Drury Lane. Lord Holland flattered Kemble; Kemble flattered Lord Holland. [. . .] Anyone would have thought that the English Stage had taken its origin from Kemble - Garrick was never mentioned - when all that Kemble has done for it has been to improve the costume. Yet Kemble is really & truly the Hero of all ranting; all second rate ability find it much easier to imitate his droning regularity than the furious impulses of Kean, who cannot point out when they come or why, but is an organ for Nature, when she takes it in her head to play on him. Sir Walter Scott breakfasted with me with Lamb, & Wilkie, and a delightful morning we had. I never saw any man have such an effect on company as he; he operated on us like champagne & whisky mixed. It is singular how success & want of it operate on two extraordinary men, Wordsworth & Walter Scott. Scott enters a room & sits at table, with the coolness & self possession of conscious fame; Wordsworth with an air of mortified elevation of head, as if fearful he was not estimated as he deserved. Scott is always cool, & amusing; Wordsworth often egotistical and overbearing. [. . .] Scott’s success would have made Wordsworth insufferable, while Wordsworth’s failures would not have rendered Scott a bit less delightful. The death of his brother [in December 1818] wounded him deeply, and it appeared to me from that hour he began seriously to droop. He wrote at this time his beautiful ode to the nightingale. ‘Where Youth grows pale & spectre thin & dies!’ - alluded to his poor Brother. As we were walking along the Kilburn meadows, he repeated this beautiful ode, with a tremulous undertone, that was extremely affecting! I was attached to Keats, & he had great enthusiasm for me. I was angry because he would not bend his great powers to some definite object, & always told him so. Latterly he grew angry because I shook my head at his irregularity, and told him he was destroying himself. The last time I saw him was at Hampstead, lying in a white bed with a book, hectic, weak, & on his back, irritable at his feebleness, and wounded at the way he had been used; he seemed to be going out of the world with a contempt for this and no hopes of the other. What a scene was Westminster Hall on Thursday last! It combined all the gorgeous splendour of ancient chivalry with the intense heroic interest of modern times; every thing that could effect or excite, either in beauty, heroism, grace, elegance, or taste; all that was rich in colour, gorgeous in effect, touching in association, English in character or Asiatic in magnificence, was crowded into this golden & enchanted hall! I only got my ticket on Wednesday at two, and dearest Mary & I drove about to get all I wanted. Sir George Beaumont lent me ruffles & frill, another a blue velvet coat, a third a sword; I bought buckles, & the rest I had, and we returned to dinner exhausted. [. . .] I dressed, breakfasted, & was at the Hall Door at half past one. Three Ladies were before me. The doors opened about four & I got a front place in the Chamberlain’s box, between the door and Throne, & saw the whole room distinctly. Many of the door keepers were tipsey; quarrels took place. The sun began to light up the old gothic windows, the peers to stroll in, & the company to crowd in, of all descriptions; elegant young men tripping along in silken grace with elegant girls trembling in feathers and diamonds. Some took seats they had not any right to occupy, and were obliged to leave them after sturdy disputes. Others lost their tickets. Every movement, as the time approached for the King’s appearance, was pregnant with interest. The appearance of the Monarch has something the air of a rising sun; there are indications which announce his approach, a whisper of mystery turns all eyes to the throne! Suddenly two or three run; others fall back; some talk, direct, hurry, stand still, or disappear. Then three or four of high rank appear from behind the Throne; and interval is left; the crowds scarce breathe! The room rises with a sort of feathered, silken thunder! Plumes wave, eyes sparkle, glasses are out, mouths smile. The way in which the King bowed was really monarchic! As he looked towards the Peeresses & Foreign Ambassadors, he looked like some gorgeous bird of the East. After all the ceremonies he arose, the Procession was arranged, the Music played, and the line began to move. All this was exceedingly imposing. After two or three hours’ waiting, the doors opened, and the flower girls entered, strewing flowers. The exquisite poetry of their look, the grace of their actions, their slow movement, their white dresses, were indescribably touching; their light milky colour contrasted with the dark shadow of the archway. The distant trumpets & shouts of the people, the slow march, and at last the appearance of the King under a golden canopy, crowned, and the universal burst of the assembly at seeing him, affected every body. I am married! Ah, what a crowd of feelings lie buried in that little word. I cannot write or think for the present. I thank God for at last bringing me to the arms of the only creature that ever made my heart burn really, & I hope he will bless me with health & understanding & means to make her happy & blessed. Dearest, dearest Mary - I cannot write. Walked into a delicious meadow, and sat down on an old stump behind some hay ricks, my back turned on the Edgware road. It was a beautiful seclusion; just after passing the Turnpike near West End Lane, you turn down a lane which leads to the Harrow road; about a dozen yards on the left is a style, & close to the style hay ricks & a fallen stump. Here I sat and read Xenophon’s treatise on riding & Cavalry exercise, in a French translation, which decidedly proves the Greeks did not shoe their Horses, as he gives instructions how to get the hoof so firm that it shall resist injury successfully. Went to see the King’s procession to open the London Bridge, by particular desire, that is, of Master Frank, Alfred, Frederick, Harry, & Mary Haydon, not forgetting Mrs Mary Haydon the Elder. Well, I went, to the gallery of St Paul’s, and after waiting about 5 hours, a little speck with a flag and another little speck with a flag, and another speck in which I saw ten white specks, and 6 red & yellow specks, came by, & immediately 200,000 specks uttered a shout I could just hear, and some specks waved handkerchiefs, & other specks raised hats, and this, they said, was the King, and directly a little round ball went up in the air and that, they said, was an air balloon, and then they all shouted, and Mrs Mary Haydon the Elder had a pain in her stomach, and Master Frederick wanted to drink, and Miss Mary said she was faint, and Master Frank Haydon said, ‘is this all?’ - and Mr Haydon said he was very hot, and then they went down an infinite number of dark stairs and got into a coach & drove home, & each fell asleep and this was pleasure. Now if Mr Haydon had gone to work with his Xenophon, neither Master or Mrs or Mr Haydon would have had a pain in their bellies and Mr Haydon’s Back-ground would have been done, and his Conscience would have been quiet, & now he has spent 1.18.6 to get a pain in his belly, and has the pain without the money - and this is pleasure. This day my dear little child Fanny died, at 1/2 past one in the forenoon, aged 2 years, 8 months, & 12 days being born on March 6th, 1829. Dear Little Soul, she had water in the head, all the consequences of weakness & deranged digestion, and was one of those conceived creatures, born when the Mother has hardly any strength from the effects of a previous confinement. Good God! She never spoke, or was not able to utter syllable, & never walked. Reader, whoever thou are, shrink not from Death with apprehension. Death was the greatest mercy an Almighty could grant. Went to Gravesend with my family for a day of relief & pleasure. First we got into an Omnibus & were jolted & suffocated [to] the Bank. Second the Steamer at the Bridge had just gone. Third we had to wait amongst the Porters & Packages 3/4 of an hour for the next. 4th we got on board the sunny side in a cabin, close to the Boiler, & were alternately baked by the sun & broiled by the steam pipe. Fifth we got to Gravesend tired & hungry. 6th we walked to a romantic love lane, which was a garden straight walk with dirty wooden seats, and sundry evidences that people in Gravesend had good digestions & sound peristaltic motion. 7th we ordered Roast Beef for Dinner, and my dear Mary kept her appetite to enjoy a hearty meal, when the Landlord put down lamb she hated & so did I. 8th we had rum as hot as aqua-fortis, & then old port as weak as children pap. We all got aboard with indigestion. I fell asleep on Deck & got a pain in my head, and we got home tired, grumbling, ill humoured, had tea & crept to bed. Today I am heated, discontented, & indignant, & it will take 24 hours more to recover in. For this earthly happiness I paid 2.12.6. - enough to feed us for a week! - so much for pleasure. Continually attending to Exhibitions is dreadful and if you do not, you get robbed. These things an Artist should have nothing to do with; details of business injure my mind and when I paint I feel as if Nectar was floating in the Interstices of the brain. God be praised, I have painted today. God forgive - me - Amen. Finis of B R Haydon ‘Stretch me no longer on this tough World’ - Lear. End.